Madelyn Jablon knows the continuous and “tangible” benefits of Guru’s Grace. In 2003, Madelyn was living in Rehoboth Beach, a sleepy resort community, with very little to do. Madelyn started taking yoga classes because it was the only thing in town during the off-season. She attended daily classes. At the time, Madelyn worked as a high school special education teacher so she especially enjoyed being in the student’s role in her yoga classes. Madelyn followed her teachers’ suggestion and enrolled in Foundations of Svaroopa® Yoga —to deepen her own practice. Madelyn also took Svaroopa® Vidya Meditation courses twice. In the final Shavasanas of her yoga classes, Madelyn often experienced “blue lights.” When she shared this with her teacher, she was told to attend a Shaktipat Retreat. Madelyn now jokes that she attends a shaktipat retreat every year, whether she needs it or not! She is also a regular at Swamiji’s Sunday Satsangs, and practices meditation as well as yoga at home daily. Madelyn does seva as an Ashram baker and prepares the snacks for Swami Sunday’s chai recess. 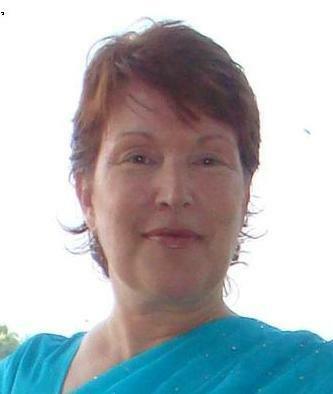 With her consistent and deepening yoga practices, Madelyn experiences profound benefits. Her meditations are especially rich experiences. In her home, she does arati (the candle flame ceremony) to Swami Nirmalananda’s photo. In meditation, she senses Swamiji’s presence. At first Madelyn struggled with the idea of a Guru-Disciple relationship and acknowledging Swamiji’s influence and power. Now she visualizes this spiritual relationship as a bicycle ride. Madelyn says, “I am holding one handlebar and Swamiji is holding the other. When I am uncertain of the course, I lighten my hold of the handlebars and feel Swamiji take control of the steering. If she didn’t, I would fall and crash. When I do not know where I am going, she guides me. As long as Swamiji is with me, I will not fall.” Madelyn knows that she is guided by Swamiji. She also feels Kundalini’s guidance. Madelyn says that her morning chant of the Kundalini Stotra is the most potent of her practices. Madelyn hung up the phone and thought, “I guess I’m going to have to help myself…self…SELF!! I know what that means: DO MORE YOGA!” Her next phone call was to a Vichara (guided self-inquiry) Therapist, who answered the phone and helped Madelyn through this difficult time. During that year, Madelyn meditated and saw its powerful effects on herself, her husband, physicians, hospice workers and even the hospital valet, who noticed the mala she was wearing. He asked her about it and whether she could get him one. Hospital nurses told Madelyn that they found her husband’s room calm and peaceful. They asked whether they could sit in her chair during their breaks. While other patients refused painful procedures, Madelyn meditated and played Sri Guru Gita while her husband slept through spinal taps and whole brain radiation. A doctor who had performed surgery during Sri Guru Gita asked her for a copy of the CD. The hospice staff asked questions about the puja she had set up in her husband’s room. They were curious. They could feel its transformative power in the room’s atmosphere. As her husband’s illness progressed, Madelyn recalls doing increasingly less thinking and more feeling, trusting spontaneity and Grace. Ujjayi made living unpredictably possible. Madelyn found she could survive with little sleep and irregular meals. At the onset of her husband’s illness, Madelyn shared the news with Swamiji, who told her that caring for her husband was her dharma — her responsibility. As a result, Madelyn knew that, though it was difficult, she was doing exactly what she was meant to be doing. Madelyn was the final speaker at her husband’s memorial service. This event provided a measure of how radically Madelyn had been transformed by being steeped in the Svaroopa® Sciences practices. Formerly, she would have been immobilized by fear at the prospect of addressing 200 people at such an emotionally-charged event. What would she say? In the past, she would have spent weeks thinking, writing, stressing. Instead, she came home from school and flipped open a magazine. It opened to a poem, “Marriage.” She gave thanks (another experience that was happening spontaneously) and took the stage with confidence. In January, Madelyn will take Foundations of Svaroopa® Yoga again, perhaps for a different reason this time. Meanwhile, you can find Madelyn either in Newark or Rehoboth, caring for her dog. He loves her yoga room. Together they visit there often! This entry was posted in Ashram News on December 26, 2017 by Svaroopa Vidya Ashram. One Christmas, while my sisters were playing happily with their new toys, i retreated to my room to cry. I remembered my mother asking me why I wasn’t happily playing with my siblings. My answer was that I was sad because I had so much and there were so many children who had nothing. I now know that I had created an identity around being a caring little person. This was the source of my sadness. I still have an aversion to all the excess of the winter holiday season: food, parties, lavish gifts. Fortunately, “You Are the Light You Celebrate,” our December teachings article, has helped me come to grips with my aversion. The article points us to the different yogic “road maps” for moving through the holidays. Throughout 2017, our monthly contemplation articles have detailed these maps. In the midst of holiday glitter, these maps can show us tried and true ways to recognize that we are, indeed, the true Light of Consciousness. To find my inner Light, I chose the map of tracing back through the kleshas. One klesha is aversion (“dvesha” in Sanskrit). Why am I so averse to the things that bring so many people happiness and connection with one another? The map says that dvesha is actually hiding a desire that you cannot fulfill. The desire is called raaga. So I tracked inward a little further and discovered that I actually DO have a desire. I want to experience the “highs” the holidays can bring — the excitement, joy, giving and receiving. The klesha road map says you must keeping tracking inward in order to dissolve the roots of each klesha. The next is asmitaa, identity. We all create identities around what we do, who we know, where we are located. This brought me to that powerful memory of the identity of a caring person, since I was a child. And this rather painful identity arose from the deepest and most powerful kleshas — avidyaa. “A” means “not” and “vidya” means “knowing.” The translation is literally “not knowing who you really are” — not feeling good enough. This can be scary and intense. I certainly experienced this as a child. I didn’t know then what I know now. The Svaroopa® Sciences have awakened me to knowing I am the Light of Consciousness. Receiving Shaktipat from Swamiji was the primary key to this deep inner opening. I experience who I really am, so I don’t have to take on identities, desires, aversion or fear. I write this from Ganeshpuri, India, on retreat with Swami Nirmalananda and other Svaroopa® yogis. Here, Swamiji sat at the feet of her Guru, as I now sit at hers. When I return home just before Christmas, I will approach the season and my nearest and dearest from a deeper sense of my own being. And I will follow Swami and Rukmini’s advice in our December teachings article. I will remember my own light and do more yoga in order to keep discovering who I really am. This entry was posted in Ashram News, Ganeshpuri on December 20, 2017 by Svaroopa Vidya Ashram. Our many donors in our Fall Fundraiser prove this to be true. You manifest this again and again, when you support our Svaroopa® Sciences and Swamiji with such loving generosity. I am filled with such gratitude for your gifts. Today I saw an ad saying, “Reinvent Giving.” The ad’s intent is that you purchase an extravagant holiday gift. It promoted a personal payoff, essentially “buying” the love and gratitude of others. However, the ad moved me to contemplate how yoga is reinventing giving for us yogis. Yoga purifies your generosity, making it a selfless offering, born of an open heart, needing nothing in return. This is when giving or serving propels you into your Self. Consider what happened for you when you made your donation — did you experience quiet mind, expansive heart, and perhaps deep joy? Did it propel you into your Self? Then you’ve found the yoga in the giving. 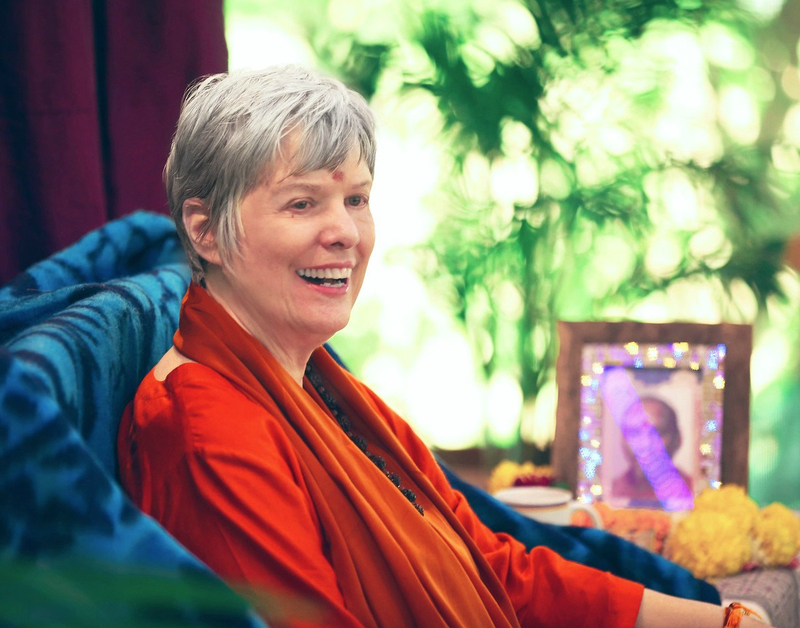 Swamiji recently shared that She has lived a Grace-filled life. This does not mean that life was always easy. She has had, as we all have had, many trials, hardships and pain. Yet even in the midst of the “worst” that life can offer, Grace is there. You can see it when you look more closely. There is so much to be grateful for, isn’t there? You can be grateful for your yoga, your teacher, the loving support of your fellow yogis, and for the amazing promise of yoga — that you will know your own Divinity. Look, and you will see Grace in places you were not aware of before. Thank you so very much for supporting the financial needs of the Ashram and Swamiji. If you would like to add a last minute year-end donation to our campaign, please click here. I wish you a Merry Christmas and Happy Hanukkah. I wish you a Grace-filled New Year. This entry was posted in Ashram News on December 19, 2017 by Svaroopa Vidya Ashram. These yummy New Year’s pancakes are easily digested by all Ayurvedic constitutions. With all six tastes, these pancakes are more savory than sweet, making them a good main course at any meal. Mix the split mung dahl and the rice and then rinse well. When they have soaked for about two and half hours, finely chop or shred a medium zucchini. Sprinkle it with the half teaspoon of sea salt, and mix it all together well with your fingers. Let it sit for an hour to draw out the water. Then squeeze it with your hands to expel all of the water, so it doesn’t make the pancakes mushy. The salt left will help flavor the mix. Set to the side. Chop the red bell pepper half, two scallions, and a handful of cilantro. Separately, chop the yellow onion. Strain the soaked rice and bean mixture, and transfer it to a good blender. Add the cup of water and the half teaspoon of salt. Blend it quite well it’s until smooth and looks like pancake batter. The beans and rice will be pretty well liquefied. Add the chopped yellow onion and blend again to pretty much liquefy the onion. Pour the batter into a large bowl and stir in the shredded zucchini, chopped red pepper, scallions, and cilantro. Use a wooden spoon to avoid bruising the veggies. Add a little ghee or oil to your cooking pan, on medium heat. Cook the batter like pancakes. They are nice dipped in a little tamari or with a tamarind sauce, which you can buy ready-made. Yummy! This entry was posted in Ashram News on December 17, 2017 by Svaroopa Vidya Ashram. Heart opening affects my day-to-day life. It makes me look at everything and everyone in a whole new way. I can find gratitude in anything. I am even grateful for the drug addict who lives across the street. I used to judge him. But now I know, he is the same as me. How can I be upset with him and not be upset with me? This even carries forward to how I feel about politics and about drivers who cut me off. The Svaroopa® yoga practices, given to us by Swami Nirmalananda, are the Grace-filled fuel powering this transformation. As I continue my daily Ujjayi, meditation, asana and seva, my heart sheds layers of bindings. As it continues to expand, I see all people differently. I don’t have to like the way they act. Yet I see that everyone at their core is Shiva — Pure Consciousness, Divine Essence. It continues to amaze me. It all interweaves. Whenever I am immersed in a program with Swamiji and hear her teachings, something transformative happens within. With this internal shift, I comprehend more and more that all external behavior as well as family, community and world events are just the play of Consciousness. I know this is because Swami Nirmalananda has given me my Self. She continues to teach me about my small-s self as well as my capital-S Self — the One Self Being Me. As I do the Svaroopa® Sciences practices, I find more and more of who I really am. My heart opens. Gratitude and generosity swell more and more and more. The generosity that arises from gratitude compels me to give back to our Ashram through seva. When I first stepped onto the Svaroopa® Sciences path, I got big changes from doing very little Svaroopa® yoga. I was so grateful. 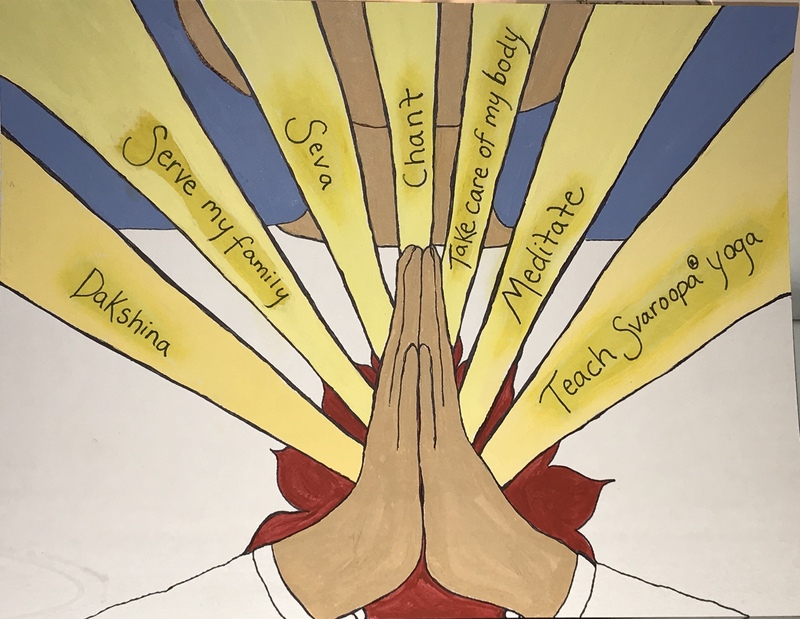 So even before taking Svaroopa® Yoga Teacher Training, gratitude compelled me to offer my time in selfless service — seva. My first seva was most mundane. Now my seva responsibilities have grown. I accept whatever Swami asks me to do. She asks me to do things I’ve never done before. This causes me to grow. Then I see more of my Self. As I am trying to help Swami, it’s taking away the bindings that have been closed around my heart and my mind for eons. Seva opens my heart more and more. The more I give, the more I get. This is MahaLakshmi at work. I also give financially. What I give each month is less than what I used to spend on coffee at Starbucks. A lot of the time I don’t think about it. But, at the first of the month when it’s deducted from my account, I get an email. I think, “There goes a donation to Swami!” It makes me smile. I know I’ve done something worthwhile, and it is an expression of the gratitude and generosity I feel towards all things flowing from Swamiji and the Ashram. Please join me in giving back to this Source. Click here to donate on online, or call the Ashram at 610.644.7555. Every gift, of any size and frequency, makes a difference. Thank you. This entry was posted in Ashram News on December 13, 2017 by Svaroopa Vidya Ashram. Her words startled me. Unbelievable. Just by being human we have value. You mean, I’m not inherently bad? I work hard to mask shame-filled identities that de-value and dis-respect me. Those identities fill me with anxiety and take me out of my body. I didn’t understand how much I wasn’t present in my body until the retreat. I became aware of all the armoring I’d put on to protect myself from traumatic events in my past. The layers hardened into life patterns and identities. They keep me from being fully alive and present in my body. In my daily yoga therapy sessions, all I had to do was lie down and allow my body to sink into the blankets. I gratefully complied. It was like my body fell open, tensions simply dissolving. I felt incredibly cared for, supported and safe. I experienced the yoga therapists acting as Love Incarnate. They had neither attachment nor need for us to respond a certain way. I surrendered to their confident placements of my body and questions in the vichara sessions. I sank in deeper. It was pure bliss. My body felt like warm, rising holiday bread. I was fully alive, floating in a timeless state of upliftment of body, mind and more. Every day, Swamiji spent a lot of time with us. She chanted and meditated with us. After chanting Sri Guru Gita with her on the second morning, I experienced a big rounded opening in my chest during meditation. It was like a giant garage door opening out to Swamiji. Swamiji also gave talks about healing, explaining the five sheaths and how they interweave. Because of this interweaving, it’s necessary to approach healing from several angles to effectively heal the multi-dimensionality of our being. Vichara and yoga therapy sessions heal mind and body. Meditating with the Guru and dipping into Self is the greatest healer of all. One of my favorite poses has always been Supported Fish. I was very happy when my therapist put me in that pose. On the third day, she probably only adjusted my arms by a small amount, but it seemed like she moved them a good three feet. Exposure! My first thought, after wanting to tuck back in and down, was that she must have made a mistake and didn’t position me right. It was fully intentional, and she didn’t move me back to “safety.” I don’t remember ever feeling my chest that open before. Never. It felt scary and daring. My mind flared up, looking for a way out of this predicament. Then I recognized that it was a safe environment. I knew the therapist wouldn’t hurt me. Her confident and nurturing presence gave me reassurance. I allowed my chest to open. It felt as wide as a football field. Soon my head opened. My face released its protective front. Knots inside my head vanished. I still had a face, but it was no longer the fearful gatekeeper. While my identities were there still, they were background, not leading or defining me. They were like space debris floating around. They did not weigh me down or hold me back. The Self was primary, everything. I was wide open inside my body and beyond, infinite and blissfully expansive. Back at home, I feel more open, less guarded. The personalized asana routine I received and my other practices bring me back to a new level of openness more quickly. I have deep gratitude for the Guru, the master door opener to self and Self. I am also grateful for the steady yoga therapists who helped me unravel layers that had limited my awareness of Guru and Self. This entry was posted in Ashram News on December 10, 2017 by Svaroopa Vidya Ashram. I used to tuck deeper into my covers, longing to stay in bed, when my alarm clock awakened me. Now I still tuck down for a few extra minutes. Then I reflect on what my first Svaroopa® yoga practice will be. Often, it’s listening to one of Guruji’s talks online. Then I dive into meditation. How alive I feel as I explore the depths within! I recall one meditation in particular. I have had some life experiences around which I created a web of thoughts and emotions. In meditation, I had an experience that felt like a video review of one of the especially stubborn patterns. I saw the image, feelings and thoughts as if they were being untwisted and lifted out of the top of my head. I felt an instant sense of gratitude and deep love for my Guru and lineage. That is Grace and Gratitude. One of my co-workers recently experienced a loss. On her third day returning to work, she looked at me and said, “You have no idea how crazy I am inside. I have been downloading meditation apps. I need to do something to help me the way your meditation helps you.” I offered her a CD with Swamiji’s Guided Awareness in Shavasana and with Ujjayi breathing. My co-worker took it home and began practicing it nightly. On the third night, she said she slept the entire night. She has a fresh smile and perk in her step. That is Grace and Gratitude. Every time I visit our Ashram in PA, whether it is online, through a phone call, seva, community gathering or reading, I experience my Self. The Shakti flows through it all. I have found the answer to my yearning. That is Grace and Gratitude. When I offer my time, talent or treasure, I experience my Self. I graciously give financial support monthly to Swamiji and Lokananda. I look forward to the annual fundraisers and save in anticipation of giving more. That is Gratitude and Grace. I thank each of you for being part of this community and graciously giving. Support creates release! Gracious living and giving is Gratitude and Grace. Please join me in supporting our Svaroopa® Vidya Ashram. Please click here to donate, or call 610.644.7555. Every gift, of any size and frequency, makes a difference. This entry was posted in Ashram News on December 6, 2017 by Svaroopa Vidya Ashram.